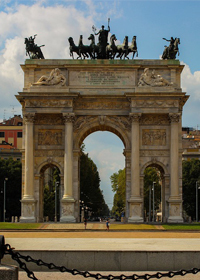 HomeLovers is the sector leader for short rent in Milan, and it offers numerous housing solutions to those who need or are about to move into the city for a continuous yet limited time frame. The website offers a wide range of flats of various sizes, located in strategical places in Milan, to those who are willing to spend a period of vacation, work or transitioning for all and any necessities. The mechanism on which HomeLovers is based is rather simple: It acts as a reference point between buyers and flat owners, in case of short rents in Milan. The apartments are fitting for all portfolios and requirements, and are already fitted with furniture, clean, WiFi equipped and ready to be inhabited. One would only need to provide the time window for the booking and the chosen zone, then check for availability and for the most adequate price for his or her own possibilities, then simply obtaining a valuable alternative o hotels or residences, which is still able to offer all of the required commodities. HomeLovers is specialized in real-estate and is particularly dedicated towards short rents in Milan, therefore to apartments to be used for short stays. In the appropriate sections it is possible to find all of the guaranteed services to the tenants which require them. Furthermore, for each specific question, it is possible to contact one of the staff’s delegates, which may guide each customer towards the most fitting apartment for its own needs and desires. With HomeLovers, immediately feeling at home is possible, even when you are away.